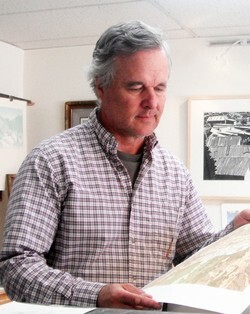 Denver, Colorado, printmaker Leon Loughridge will demonstrate his techniques in a residency Feb. 26 through March 2 on the SFA campus. NACOGDOCHES, Texas - The printmaking and graphic design programs within the Stephen F. Austin State University School of Art will sponsor visiting artist Leon Loughridge the week of Feb. 26 through March 2. Loughridge, a printmaker from Denver, Colorado, and owner of Dry Creek Art Press, will work on an edition of handmade prints while in residency on the SFA campus, and he will teach classes in the Japanese Moku Hanga style of printing. A free public presentation of his work and unique techniques is scheduled for 5 p.m. Wednesday, Feb. 28, in Art History Lecture Room B106 in the Art Building off Wilson Drive. Loughridge developed an affinity for the Southwestern landscape while growing up on a ranch in Northern New Mexico and then attended the Colorado Institute of Art. While stationed in Germany with the U.S. Army, he traveled extensively throughout Europe and studied painting techniques of the old masters for two years. He is noted for his layered woodblock prints, which capture the atmospheric qualities of the southwestern landscape. His woodcuts are exhibited nationally and collected by museums and collectors. He has also developed a versatile ink base. As a printmaker, Loughridge states that he wants to record in printed form the "emotional connection" he has to his original plein-aire sketches and paintings. "While sketching is a very direct and invigorating process, creating a print in the studio is almost the opposite - slow and methodical," he writes in his artist statement. "The challenge of translating a painterly image into a block print is to capture the energy of the original into the print, not to merely duplicate the image. Using the technical aspects of relief printing as expressive tools, and not as limitations, allows for an intuitive and spontaneous print. To see that the passion of the original sketch has been translated into the print is the artist's reward." Art faculty members Neal Cox (printmaking) and Peter Andrew (graphic design) have organized Loughridge's residency. For more information, call the School of Art at (936) 468-4804. 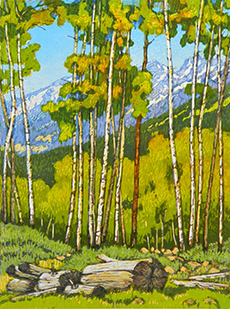 "Aspen Stand" is by Colorado printmaker Leon Loughridge, who will give a free public presentation of his work and techniques at 5 p.m. Wednesday, Feb. 28, in Art History Lecture Room B106 in the Art Building off Wilson Drive.